Cognilytica tracks almost 3000 companies that offer AI-specific or AI-enhanced products for sale in the market. Like most analyst firms, we call these companies “vendors” because they are offering products for sale verses the enterprise “end users” who are implementing them. However, as you can imagine, there’s a great amount of diversity in these vendors. Some vendors focus on providing low-level “enabling” infrastructure that supports any range of AI, machine learning, or other compute- or data-intensive activity. Others provide a single-industry application that applies AI to a particular, specific business or industry problem. And of course, there’s a whole range in the middle. The main challenge that end users face is that they need to evaluate vendors in the context of the business problems they are trying to solve. These vendors are not at all the same, and in many cases, comparing them to each other is a frustrating activity of comparing apples and oranges. Some of the most widely circulated lists, or “classifications” of vendors are laughably terrible. They lump vendors together that don’t solve the same problems or have very little in common. These vendor charts are a mish-mash of logos from a lot of firms confusingly arrayed on an image or a slide and presented like a gigantic tossed salad. Nothing makes sense. There’s no way to evaluate which vendors are truly comparable with others and how different solution areas relate to each other. Customers are confused. Vendors are being confusing. And other analyst firms and consultancies aren’t helping. They’re pushing their old research into new areas, dusting off their big data-this or automation-that or customer centric-other-thing and relabeling it as AI, or simply have a one-track perspective of AI applied to a specific domain. No wonder everyone is confused and customers are slow in their AI uptake. We’ve had enough of the other classifications and decided to spend the past few months doing our own completely new, original research. 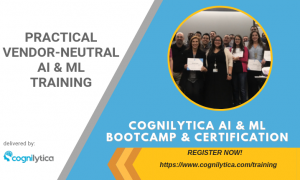 Cognilytica is the only firm with a holistic view of the AI landscape. We looked closely at all 3000+ vendors in the market (there’s over 6000 if you believe the Crunchbase listings of AI companies). We classified them into narrow segments that put the most similar vendors together in a category. We then grouped these categories into groupings that all shared similar characteristics. We then sorted these into layers to show how some technologies enabled solutions higher up on the stack, or to show how a high-level solution would obviate the need for lower-level technology. This post, and all of our research, will feature this classification system and we encourage you to share our classification charts so that they can push out all the other bad examples in the market. In this article, we’ll share the overview of the classification system and the full details of the bottom three layers of the classification matrix. The top layer is so big that it needs a post of its own! Cognilytica sorts the vendor landscape into a “stack” of four layers that progress from the most generally applicable technology on the bottom layer to the most industry-specific applications at the top. Generally speaking, technologies and vendors at a lower level might be utilized by vendors at a higher level, or vendors that sell solutions at a higher level in the stack might make the need for lower level technology irrelevant or unnecessary. 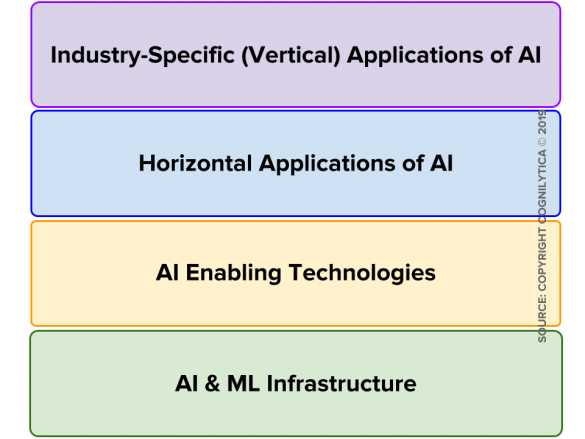 At this lowest level of the layer cake that is the AI Vendor Ecosystem stack we have technologies that are broad and general in helping to develop and implement AI, machine learning, and the broad range of cognitive technologies. These solutions aren’t necessarily purpose-built for AI and ML, but they provide necessary underlying infrastructure technology from vendors that specialize in that infrastructure. These infrastructure technologies are primarily data science platforms aimed at solving the broad range of data science problems, whether or not applicable to artificial intelligence, machine learning, or cognitive technologies. The vendors we profile in this category are the ones that have specifically optimized or enhanced their products and services for AI and ML applications. In this way, they provide broad data science capabilities, but can handle the needs of AI-focused data scientists. Data Science Platforms with Built-in AI Support – These are general purpose data science platforms with built-in ML capabilities, especially support for a broad range of ML algorithms, hyperparameter optimization and experimentation, AI-focused data science notebook sharing, support for ML toolkits and libraries, and the ability to operationalize any models defined in the system. Data Science & ML Project Management – These are general purpose project management tools aimed at solving data science-specific project management and workflow considerations, with specific and deep support for AI and ML workflows and processes. Helps to manage data-centric process flow, handle all the iterations and governance of models, and other aspects of coordinating overall AI-focused data science projects. Vendors in this category are primarily big data vendors solving big data problems with big data solutions, but have specifically added capabilities to handle AI and ML workloads and handle the big data-centric needs of AI and ML. AI-Enhanced Big Data Platforms – Big data storage platforms optimized to handle the workloads and needs of AI and ML-specific activities on big data. AI-Enhanced Big Data Visualization – Visualization platforms that usually operate on big data that is optimized or enhanced to provide AI and ML-enabled visualization or other action on big data to power visualizations. 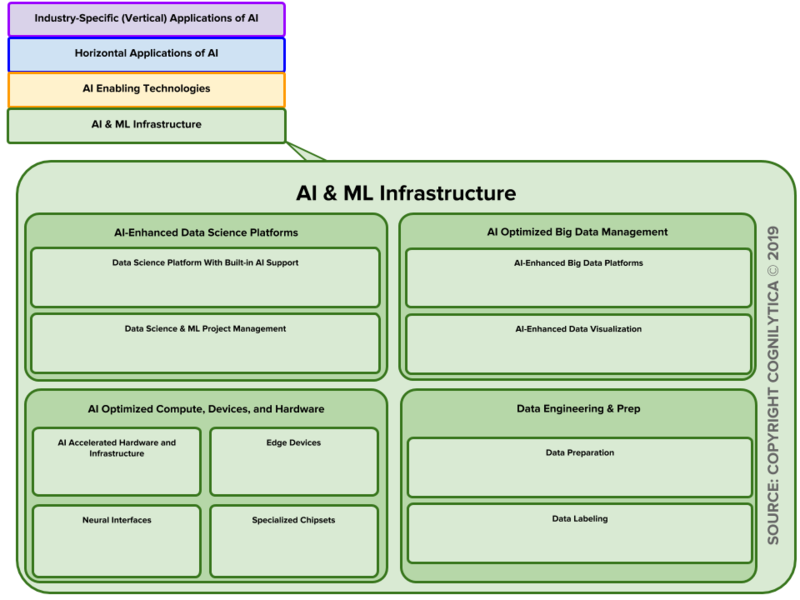 In this category of AI & ML Infrastructure we have a range of hardware and compute-focused devices and computing technology that aim to optimize, decentralize, or specialize in the various AI and ML specific tasks, calculations, algorithms, or other activities as necessary, thereby offloading workload from more general-purpose computing equipment, servers, and technology. AI Accelerated Hardware and Infrastructure – Computing, storage, and networking infrastructure that has been specifically optimized for AI and ML workloads. Edge Devices – Special devices that sit at the end / edge of networks providing AI and ML capabilities in any state of connectivity to global networks. Neural Interfaces – Specialized human brain-computer interfaces. Specialized Chipsets – Purpose built chips and hardware optimized for AI and ML processing and activities. Within this category of AI & ML Infrastructure are vendors that help prepare data in any state of quality, cleanliness, data source, or format for AI and ML-specific applications. These vendors can provide software, services, or human-assisted software to assist with the various tasks of preparing data and labeling it for supervised learning applications. Data Preparation – Software, tools, technology, and services aimed at improving the usefulness, quality, format, and value of data being used for AI and ML specific applications. Data Labeling – Offerings focused on taking unlabeled data and creating labels so that it can be used for AI and ML specific applications. 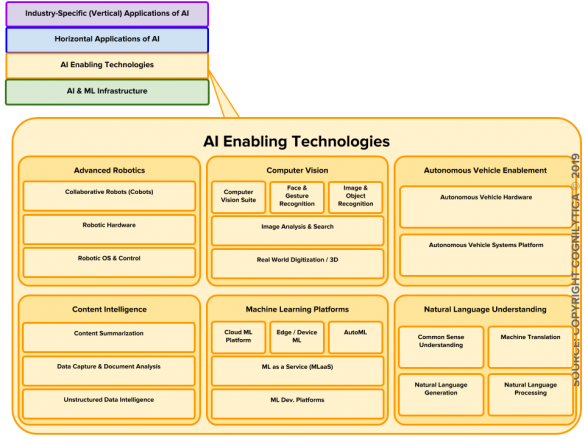 The next big layer of the AI Vendor Landscape are AI Enabling Technologies. One level up from infrastructure, these tools, technologies, vendors, and solutions are specifically and only adapted for AI, ML, and cognitive technology applications. That is to say that these solutions cannot really be used for non-AI applications without inappropriately shoehorning them in. As such, these are truly technologies that enable specific AI and ML capabilities, which others can then build their own AI and ML applications on top of. Robots of one form or another have been around for almost a century, with industrial robots showing their age over many decades. Clearly robotics on its own doesn’t have much to do with AI or cognitive technologies unless they show some aspect of perception, prediction, or planning — the 3 P’s that those in the autonomous vehicles industry like to talk about. Vendors in this category have emerged past simple bots that merely repeat pre-programmed tasks to intelligent machines that can learn and adapt to their surroundings and problems they are solving. Collaborative Robots (Cobots) – Intelligent, surroundings-aware bots that can operate in close proximity to humans and other bots or equipment and be flexibly adapted to solve new problems without requiring explicit programming. Adaptive Robotic Hardware – Hardware that enables robots to respond to and learn from the environment from example. Intelligent Robotic Control and Operating Systems (OS) – Systems of control and design that facilitate the development of or support the creation of advanced robotics applications. One of the biggest advancements AI and ML has made in the recent resurgence of interest is in the area of computer vision. ML-based systems have gotten really good at all aspects of image and object detection, facial recognition, gesture analysis, image search, and real world digitization. It’s no surprise that this category of AI Enabling Technology is rich with vendors. Computer Vision Suite – Vendors that offer a full range of computer vision capabilities including recognition, search, and analysis. Image & Object Recognition – Vendors that specialize in AI and ML-powered image and object recognition capabilities. Face & Gesture Recognition – Technology offerings that use AI and ML to recognize human faces and human gestures. Image Analysis & Search – Solutions that can search through image or video footage using AI and ML technology and be able to locate, extract, and identify key information in images, classify those images, create captions or descriptions, or otherwise give humans the ability to consume large volumes of image and video content. Real World Digitization / 3D – Solutions that aim to perceive the real world, create 3D or other representations of the real world to facilitate interaction, understanding, or processing of those real world objects. Autonomous vehicles (AV) push the edge of what is possible with AI and ML technology. Perhaps we’re not too far away from a future where Level 5 autonomous vehicles roam the roads. Or perhaps that vision may not come to pass any time soon. Regardless of where we are, there are a number of vendors selling technology that enable others to create AVs or use AV technology for a wide range of purposes. Note that vendors in this category aren’t actually building AVs themselves (that’s in the Horizontal Applications of AI layer), but rather provide enabling technology that allows others to develop those solutions. Autonomous Vehicle Enabling Hardware – Hardware-based technology solutions that leverage ML and cognitive technologies to enable autonomous vehicle applications. This includes LIDAR, visual environment perception, and mesh-networking solutions that are enabled with ML technology. Autonomous Vehicle Systems / Platforms – Software and combined hardware /software systems that enable the range of autonomous vehicle and intelligent car applications. Machine learning has been applied to give understanding to the volumes of text and document based content that exists throughout the organization. In this category are vendor solutions that give understanding to unstructured information, digitize and apply ML to get machine understanding of non-digital content such as handwritten or printed information, and analyze documents to understand their context and meaning. Content Summarization – ML technology solutions that can ingest content in digital forms and provide human-readable short summaries of that information for a wide range of purposes. Data Capture & Document Analysis – Machine learning-based technology solutions that can capture information in non-digital format and generate understanding of the document context and intent. Unstructured Data Intelligence – ML-based solutions that can process a wide range of unstructured data in the organization and gather meaningful understanding and relationships between the data. Developers and non-developer line of business users are involved in the AI lifecycle just as much as data scientists and data engineers. Developers leverage a wide range of machine learning platforms to apply ML algorithms to data and operationalize AI for a wide range of AI use cases. Vendors in this category range from developer-oriented tools to non-technical line of business general platforms that can facilitate different use cases in a low or no-code environment. Machine Learning Development Platforms – Developer-oriented tools aimed at providing a platform to develop machine learning applications and operationalize AI solutions in a wide range of use cases and different deployment requirements. Cloud ML Platforms – Cloud based platforms that provide ML capabilities to develop AI applications as well as a wide collection of additional tools to assist with data engineering, data science, deployment, training, and other aspects of ML and AI application development and operation. CloudML platforms are typically oriented towards developer and technical roles in the organization. Machine Learning as a Service (MLaaS) – Contrary to the way other analysts have approached this space, we see MLaaS as a separate vendor category different than Cloud ML platforms. While Cloud ML platforms are primarily oriented towards developers and technical users, MLaaS platforms are oriented towards the business analyst, line of business, and non-technical roles. MLaaS solutions aim to abstract much of the underlying ML complexity, providing templates, pre-built applications, low or no-code environments, and suites that apply a range of technologies, data, and operationalization models to simplify AI app development for target markets. AutoML – Vendor solutions that specifically aim to automate and simplify some of the more difficult aspects of ML application development including algorithm selection, hyperparameter tuning, training and validation considerations, and other aspects of ML. Edge / Device ML – ML platforms specifically geared towards the development, management, and operationalization of AI and ML capabilities in edge devices, devices with limited processing and storage power, or non-cloud access capabilities. Machine Learning is very well suited at providing a range of understanding of natural, human conversation. Vendors in this category approach the range of natural language understanding, processing, and generation challenges as well as help surmount some of the more difficult challenges in common sense understanding and machine reasoning. Common Sense Understanding – Vendor solutions that help facilitate more than just text to speech, speech to text, lexical understanding, or conversational flow. Rather, these help provide a real understanding of the meaning of natural conversation and the relationship between the various concepts communicated by language. Common Sense Understanding incorporates the ideas of Common Sense, Machine Reasoning, Ontologies, and Knowledge Graphs, which are all related to the concept of making more sense out of information, and giving systems the ability to derive more meaning from information beyond its literal meaning. Machine Translation – Vendor solutions that use ML and other AI technologies to facilitate translation between different human languages. Natural Language Generation – Solutions that provide a means for intelligent systems to generate content that is in natural language for human consumption. Natural Language Processing – Vendor offerings that use ML and cognitive technologies to process and gain lexical understanding of spoken, typed, or otherwise communicated human natural language and turn that into a representation that ML systems can process in conversational or other contexts. 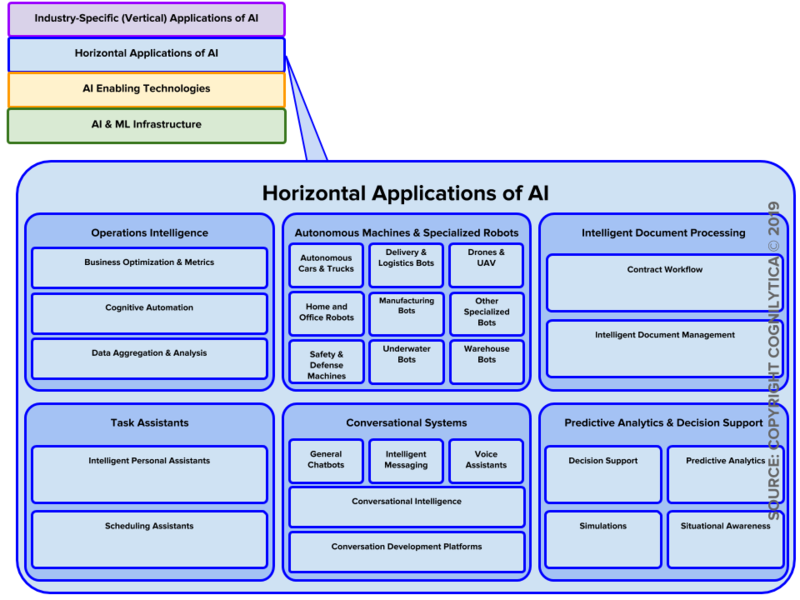 The next major layer of the AI Vendor Landscape classification are specific applications of AI to particular problem areas. These problem areas might not be aimed at a specific industry or class of industry problem, but they are built in such a way that they can’t be repurposed for another AI application, even if it is a closely related one. For example, voice assistants are a horizontal application of AI because they are a particular implementation of AI for a particular problem, but not one aimed at a specific industry. You can use voice assistants for a wide range of features, but you can’t use voice assistants to generate text content, provide pattern-based decision support, or automate your business processes. These are different horizontal applications or AI. You can, however, build industry or domain-specific applications on top of these horizontal applications, which is why they aren’t at the top of the layer cake stack we’ve developed. Unlike the enabling category of AV systems technology vendors we detailed above, vendors in this category are building, developing, and implementing actual autonomous vehicles, bots, and systems of all types to address a wide range of applications. These are listed as horizontal applications because they are not necessarily industry or domain specific, but they are also not of a sort meant to enable you to build other bots or autonomous systems on top of them. Seemingly conflictingly, cobots are not in this category because cobots are not actually implementations for any particular domain or application. You can use a cobot to mix a cocktail just as much as assemble products. This is opposed to warehouse bots that are purpose-built for specific classes of problems. Delivery & Logistics Bots – Intelligent autonomous, or semi-autonomous bots that leverage AI and ML technology to provide solutions in the realm of delivery and logistics. Intelligent Drones & UAV – Intelligent autonomous, or semi-autonomous aerial vehicles that leverage AI and ML technology for a range of different use cases. Home and Office Robots – Intelligent autonomous, or semi-autonomous bots that leverage AI and ML technology to provide solutions for personal or business use in home, hotel, or business office settings. Manufacturing Bots – Intelligent autonomous, or semi-autonomous bots that leverage AI and ML technology to provide solutions specifically for manufacturing and only applicable to that purpose. Other Specialized Bots – Intelligent autonomous, or semi-autonomous bots that leverage AI and ML technology to provide solutions not covered by one of the other subcategories. Safety & Defense Machines – Intelligent autonomous, or semi-autonomous bots that leverage AI and ML technology to provide solutions in the realm of warfare, law enforcement, defense, security, or similar applications. Underwater Bots – Intelligent autonomous, or semi-autonomous bots that leverage AI and ML technology to provide solutions for subsurface and underwater applications. Warehouse Bots – Intelligent autonomous, or semi-autonomous bots that leverage AI and ML technology to provide solutions in the realm of warehouse, fulfillment, and similar applications. Unlike the general purpose Natural Language technologies we identified above, conversational systems are specific horizontal applications of NLU, NLP, NLG, and machine reasoning technology plus other infrastructure to be used in specific conversational contexts, or development platforms that let you leverage lower-level natural language technologies and APIs to create specific conversational interfaces. Conversational Intelligence – Solutions and tools that help gain intelligence and understanding from conversations whether in spoken or written form. This understanding is meant to be at the higher organizational content level, not simply natural language understanding, and intelligence does not imply common sense reasoning, but rather application to specific already modeled domains. Conversation Development Platforms – Platforms that leverage natural language enabling technology, third party APIs, and other solutions to facilitate the design, development, management, and operation of conversational interfaces. General Chatbots – Non-industry, non-domain specific conversational interfaces meant to be applied across a range of domains. Intelligent Messaging – Solutions that give users the ability to gain more intelligence from different forms of messaging such as email, text messages, and other human-to-human communication. Voice Assistants – Spoken, conversational interfaces that provide access to a range of capabilities. Usually provided as a hardware device that enables spoken interaction and interacts with cloud-based ML capabilities. AI and ML systems can also be applied to help with complicated document processing and workflow needs including handling multiple document interactions and analyzing complicated document process flows such as those for contracts and other requirements. Contract Intelligence – Solutions that use AI and ML to gain more understanding of complicated legal contracts and other similar documents. Intelligent Document Management – Solutions that use AI and ML to power complicated and more involved document interactions. These are solutions that give enterprises and organizations intelligent control over their internal operations, business processes, and interactions between different aspects of the organization. This includes intelligent analysis of business operations and metrics, intelligent and autonomous automation of business activities, and intelligent analysis and aggregation of data. Intelligent Business Optimization & Metrics – Solutions that leverage AI and ML to give enterprises and organizations insight into operations, visibility into bottlenecks or potential problems, and visibility into patterns that might not otherwise be recognizable from data through simple dashboards. Cognitive Automation – Solutions that leverage AI and ML to give organizations the ability to intelligently and possibly autonomously automate complicated multi-step processes that otherwise require human activity or intervention. It is important to note that Cognilytica do not consider Robotic Process Automation (RPA) to necessarily be relevant to this space, in much the same way that industrial robots are not relevant to intelligent, autonomous robotics of the Advanced Robotics type we defined above. To be included in this category, the solutions must leverage ML technology to give any software bot the ability to learn after each iteration, apply that learning for dynamic change, and autonomously learn behaviors of business processes and the organization. Intelligent Data Aggregation & Analysis – Solutions that leverage AI and ML to give organizations intelligent and possibly autonomous control over aggregation and analysis of data from a wide range of sources to facilitate a wide range of use cases. The power of machine learning’s pattern match and machine learning approaches such as reinforcement learning give organizations the unique power to get insight into data that can provide insight into trends, assist with complex multi-factor decision making, and even let organizations simulate different scenarios prior to executing them. In this primary category, vendors leverage the power of AI and ML to give forward-thinking enterprises critical competitive advantages by giving them the power of forecasting, AI-enhanced decision-making, and awareness of their environment by consuming significantly greater amounts of external information. AI-Enabled Decision Support – Solutions that leverage AI and ML to give organizations the power to consume vast amounts of information and use observed patterns to make better, more informed decisions. Predictive Analytics – Solutions that leverage AI and ML to give organizations predictive and projective visibility into trends that could pose challenges or opportunities. AI-Powered Simulations – Solutions that leverage ML and cognitive technologies to let organizations simulate different scenarios to facilitate a wide range of use cases. Intelligent Situational Awareness – Solutions that leverage AI and ML to enable organizations to consume vast quantities of data from a wide range of sources to help them make decisions, understand what’s happening at a given moment, and other applications. Solutions in this primary category are focused on helping humans execute the various daily and regular tasks that need to be done, from scheduling appointments to handling various important and mundane tasks. These applications are not specific to a particular industry or domain, but might be specific to particular sets of tasks. Intelligent Personal Assistants – Solutions that leverage AI and ML to provide autonomous interactions with individuals and organizations to assist with a wide range of tasks that might otherwise be delegated to a human or virtual assistant for action. Scheduling Assistants – Task assistants that help specifically with the problem of managing or coordinating schedules, appointments, meetings, scheduled tasks, and the like. Clocking at over 4000 words, this particular article is already exceeding the typical readable length. 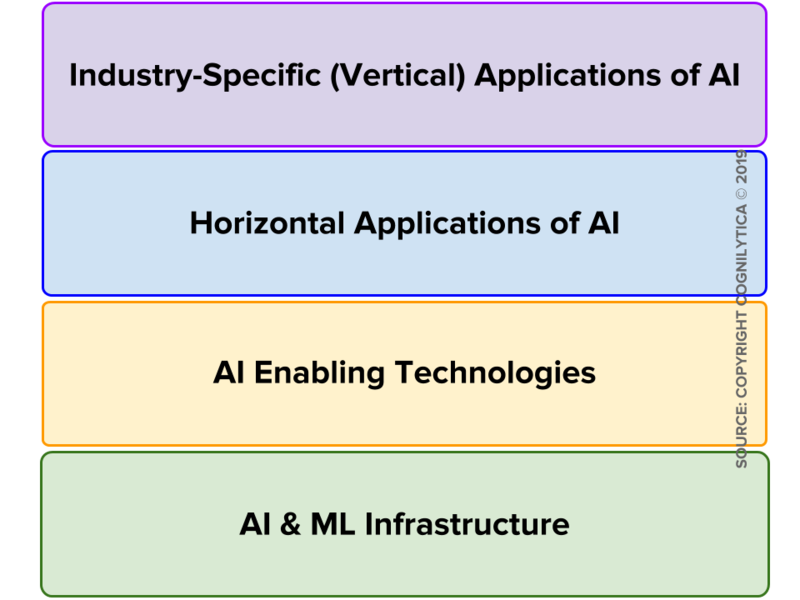 There’s only one more layer to go, and that’s the top one: Industry-Specific Applications of AI. It also happens to be a huge category. In fact, most of the 3000 vendors we track are of an industry-specific nature, so the details of what’s in this layer deserves an article of its own. Read Part II of our classification here! How will we (and you) use this AI Vendor Ecosystem Classification? The goal of this classification is to bring understanding to the complex market for AI vendor solutions. This is meant to help end users better understand how to evaluate, procure, and implement AI solutions and compare the different offerings at different layers in the stack. We will use this classification system for every single one of Cognilytica’s research reports, and we will be using it to group vendors together for the purposes of briefings. The specifics of the research schedule, briefings windows, and the clustering of categories for the purpose of research reports will be outlined in a separate article. Look for that soon!